The International Arbitration guide provides expert legal commentary on key issues for businesses. The guide covers the important developments in the most significant jurisdictions. Wilmer Cutler Pickering Hale and Dorr LLP offers one of the world’s largest and most experienced international arbitration and dispute resolution practices. The international arbitration group has been involved in more than 650 proceedings in recent years. Lawyers have successfully represented clients in a number of the largest institutional arbitrations and several of the most significant ad hoc arbitrations to arise in the past decade. The multi-national team consists of nearly 70 lawyers, trained and qualified in a wide range of common and civil jurisdictions, all of whom principally practise international dispute resolution. In addition to representing clients as counsel, many lawyers regularly sit as arbitrators in international arbitrations. The practice covers commercial and investment arbitration under the rules of all leading arbitration institutions and ad hoc arbitrations seated in a wide range of jurisdictions. We have represented individuals, companies, States and State-entities. Lawyers have recently handled or are currently handling disputes under the International Chamber of Commerce (ICC), American Arbitration Association (AAA/ICDR), London Court of International Arbitration (LCIA), Stockholm Chamber of Commerce (SCC), International Centre for Settlement of Investment Disputes (ICSID), Vienna International Arbitral Centre (VIAC), Hong Kong International Arbitration Centre (HKIAC), Cairo Regional Centre for International Commercial Arbitration (CRCICA) and UNCITRAL rules; and also have extensive experience with more specialised forms of institutional arbitration and ad hoc arbitrations. Contemporary trade and geopolitics are undergoing tectonic shifts that, in recent years, have challenged, and continue to challenge, the global rules-based order, of which international arbitration is a part. As a legal system, international arbitration is premised on judicial and legislative support, both on the domestic and international plane. Given the broader international uncertainties, it is no small feat that international arbitration has continued its trajectory of growth in the past year. 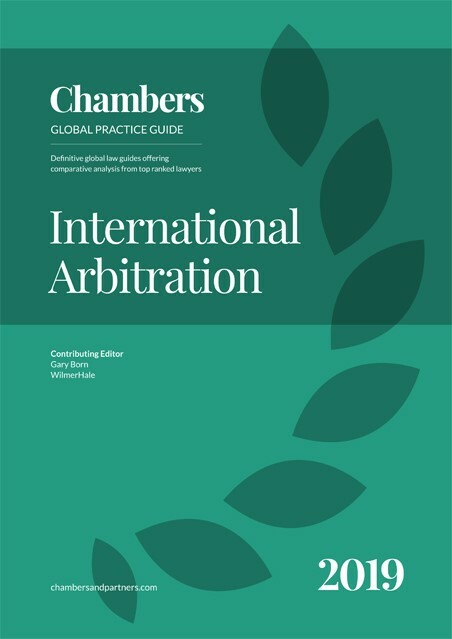 According to the 2018 White & Case and Queen Mary University of London International Arbitration Survey (“2018 International Arbitration Survey”), an overwhelming 97% of respondents select international arbitration – either on a stand-alone basis or in conjunction with other alternative dispute resolution mechanisms – as their preferred means of dispute resolution in international commerce. Commercial and other parties continue to find decisive value in the efficient, expeditious, expert, even-handed and enforceable procedures and decision-making that international arbitration provides. Indeed, the past year marked several important milestones for international arbitration. First, at the international level, the 1958 United Nations Convention on the Recognition and Enforcement of Foreign Arbitral Awards (the “New York Convention”) celebrated its 60th anniversary in 2018. The New York Convention has rightly been described as the “cornerstone of the international arbitration system.” In broad terms, the Convention requires that courts of Contracting States give effect to arbitration agreements and recognise and enforce arbitral awards made in the territory of another Contracting State. These obligations are subject to narrow exceptions. At the enforcement stage, the Convention also eliminates the cumbersome requirement of doubleexequaturthat existed under its predecessor conventions and reverses the burden of proof from the award-creditor to the award-debtor. Thus, despite its brevity (the Convention is only five pages long), the practical import of the treaty cannot be understated. Today, 159 States are party to the New York Convention, making it one of the most widely ratified treaties, whether in international commerce or otherwise. Indeed, the cross-border enforcement of arbitration agreements and awards guaranteed by the Convention is among the hallmarks of international arbitration, which finds no parallel in other forms of international dispute resolution. Most recently, Sudan acceded to the Convention in April 2018 and numerous other States are in the process of accession, including Somalia and Sierra Leone. National courts have continued to interpret the Convention in a liberal, pro-enforcement fashion, providing vital support to the international arbitral process. The continued popularity and efficacy of the Convention are central to the success of international arbitration. Second, at the domestic level, many national legislatures have introduced new arbitration laws or revised existing legislation, to keep pace with the needs of international commerce and affirm their commitment to the arbitral process. These legislative changes have been influenced, in large part, by the United Nations Commission on International Trade Law Model Law on International Commercial Arbitration (“UNCITRAL Model Law”). First promulgated in 1985, the UNCITRAL Model Law continues to reflect best practices in international arbitration legislation. Complementing the New York Convention, the Model Law requires national courts to recognise and enforce arbitration agreements and restricts the grounds for challenges to arbitral awards to limited exceptions. In addition, it affirms an arbitral tribunal’s broad procedural powers including to issue interim measures, determine its own jurisdiction and implement a procedural framework that best suits the needs of the parties. In recent years, a number of jurisdictions have adopted the UNCITRAL Model Law as a basis for their arbitration legislation, including Argentina, the Australian Capital Territory, British Columbia, Jamaica, Mongolia, Qatar, South Africa and Uruguay. Today, the UNCITRAL Model Law has been adopted in over 100 jurisdictions, and that figure will clearly increase as States around the world, including in Latin America, Africa and the South Pacific, look to the Model Law as they revise their arbitration frameworks. This legislative trend is accompanied by a continued pro-arbitration approach in most national courts. Traditional centres of international arbitration – London, Paris, Singapore, New York and Geneva – have earned reputations for being arbitration-friendly because their national courts consistently render decisions that respect party autonomy, the arbitral tribunal’s procedural discretion, and the finality of arbitral awards. These courts adopt a generally non-interventionist approach, while remaining available to provide quick and effective ancillary relief to parties, when appropriate. Indeed, the pro-arbitration ethos of the English courts is the prime reason why, despite the uncertainties of Brexit, 55% of respondents in the 2018 International Arbitration Survey believe that London would remain a leading arbitral seat. These positive judicial attitudes are also becoming common in jurisdictions that have sometimes adopted a more hostile approach to arbitration. The national courts of India and China have, in the past year, generally delivered pro-arbitration decisions that strengthen the domestic arbitration framework. The same is true in other jurisdictions, including the United Arab Emirates, Egypt and Chile. Third, arbitral institutions have sought actively to address the needs of disputing parties. Between 2017 and 2018, a number of arbitral institutions revised their rules, including the International Chamber of Commerce (ICC), the Stockholm Chamber of Commerce (SCC), the German Arbitration Institution (DIS), and the Bahrain Centre for Dispute Resolution (BCDR). Other institutions, such as the International Centre for the Settlement of Investment Disputes (ICSID) and the Hong Kong International Arbitration Centre (HKIAC), are in the midst of a rules revision process. Many, if not all, of these rules address emerging issues such as third-party funding, multi-party and multi-contract issues and expedited arbitrations. Arbitral institutions also continue to play a pivotal role in innovation. The Singapore International Arbitration Centre’s (SIAC) proposal for cross-institutional consolidation is a representative procedural innovation that offers increased time and cost efficiencies for parties as the complexity of modern trade makes multi-party and multi-contract disputes the norm. Unsurprisingly, 80% of respondents in the 2018 International Arbitration Survey concluded that arbitral institutions, due to their mandate and relative agility, are best placed to influence future trends in international arbitration. While the past year has, in many ways, been a series of successes for international arbitration, it also demonstrated that the system does not exist in a vacuum and is susceptible to larger geopolitical trends, most notably in the investment arbitration sphere. Investment arbitration faced new challenges, most importantly from the European Court of Justice’s decision in March 2018 in Slovak Republic v. Achmea B.V., where the Court held that the arbitration clause in the 1991 Netherlands-Slovakia BIT was incompatible with European Union (“EU”) law. The decision triggered further actions that raise questions over the future of investment arbitration in the EU context. Among other things, in April 2018, the Netherlands stated its intention to terminate 12 of its remaining intra-EU investment treaties with investor-State dispute-settlement provisions. In a communication to the European Parliament and Council in July 2018, the European Commission purported to expand the reach of the Achmea decision to assert that intra-EU investment arbitration under the Energy Charter Treaty is also incompatible with EU law. The wisdom, meaning and legality of these various actions is hotly debated. In light of calls for greater transparency, predictability, and accountability, some States are also re-evaluating their policy approaches to investment arbitration. The EU has proposed the formation of a multi-lateral investment court to resolve investment disputes in lieu of arbitration. This proposal is already reflected in the 2017 Comprehensive Economic and Trade Agreement between the EU and Canada (it remains the only provision of the treaty that has not entered into force). In Latin America, the 2017 Intra-MERCOSUR Investment Facilitation Protocol goes further, to exclude investment arbitration altogether. In the United States, the Trump Administration has intermittently signalled a desire to revise or eliminate Chapter II on investment arbitration under the North America Free Trade Agreement. It remains to be seen whether these various actions are something more than short-lived outbursts of protectionism. In any event, although challenging, these developments do not signal the demise of investment arbitration. On the contrary, investment arbitration continues to be the norm in most treaties, albeit in modified form, including in the 2018 Comprehensive and Progressive Agreement for the Trans-Pacific Partnership. Other multilateral agreements like the African Continental Free Trade Agreement and the Regional Comprehensive Economic Partnership are still under negotiation, and there is no indication that these treaties will exclude or replace investment arbitration. In almost all cases, however, there are express carve-outs to secure a State’s right to regulate in the public interest. A number of states have also responded to calls for greater transparency and accountability through instruments like the UNCITRAL Rules on Transparency in Treaty-based Investor-State Arbitration, and the United Nations Convention on Transparency in Treaty-based Investor-State Arbitration (the Mauritius Convention), which entered into force in October 2017. Arbitral institutions are similarly adapting to trends in investment arbitration, with institutions like SIAC and the China International Economic and Trade Arbitration Commission introducing bespoke rules for investment disputes. Likewise, ICSID is well-advanced in an ambitious rules' revision process that seeks to address a range of topical issues, including transparency, the role of non-disputing parties, and multi-party arbitrations. In sum, the past year has witnessed important developments in international commercial and investment arbitration. Developments on international commercial arbitration by States, national legislatures, national courts, and the arbitration community were largely positive and may continue to bode well for the continuing success of the system. Developments affecting investment arbitration were more varied, raising important questions about the future. Ultimately, the resilience of international arbitration depends, as it always has, on the versatility of the actors involved in responding to the needs of its participants – be it private actors, States or the larger public – and in continuing to generate innovative, contextual and flexible solutions that improve the efficacy of international arbitration for its users.